We are excited to announce the Jeff McComsey's "FUBAR PRESS" has joined forces with Alterna Comics as an official imprint. FUBAR PRESS will follow in the creator-owned mentality that Alterna is known for an will be headed by President and Publisher Jeff McComsey, Art Director Steve Becker, and Story Editor Jeff McClelland. The imprint will operate under the Alterna Comics banner as it always has but will have their own submissions, story ideas, and creative teams centering around a mash-up of historical-horror fiction. 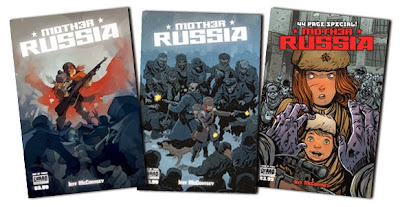 Branching out with the MOTHER RUSSIA mini-series by Jeff McComsey (debuting issue #1 in stores today), the brand is set to build on the unique story-telling and phenomenal artwork that readers have been enjoying since 2010. 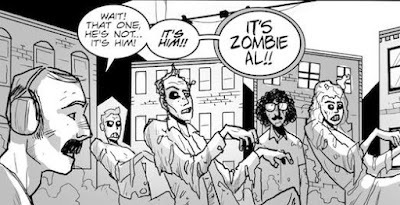 McComsey speaks about his experience with Alterna and the future of FUBAR, "I've worked with Alterna Comics on just about everything I have published since I started making comics in 2007. From my first series, AMERICAN TERROR to when Steve Becker and I published volume one of FUBAR five years ago, Peter Simeti has been a publisher I can count on. I'm very proud to finally make FUBAR PRESS an official imprint of Alterna. While we'll continue to publish FUBAR PRESS books on all platforms available, we will be focusing a large portion of our time and resources on engaging retailers and showing them why we deserve a spot on the shelf in 2015." That's all pretty great! I'm happy to be involved with the project and I hope it continues for years to come. I'm currently working on a few upcoming projects, such as a backup story for Mother Russia #3 with Jeff McComsey and Christine Larsen. 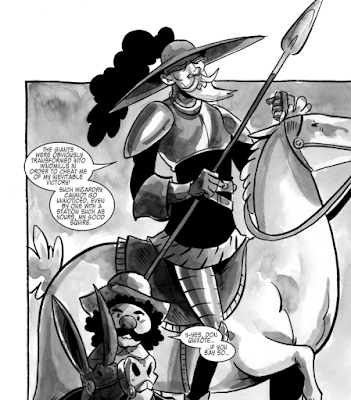 I'm reading Don Quixote, the classic novel by Miguel de Cervantes for the first time, so the time seemed right (400 years later) for a FUBAR Quixote story. Christine really did a fantastic job with it, as we should all be used to by now. 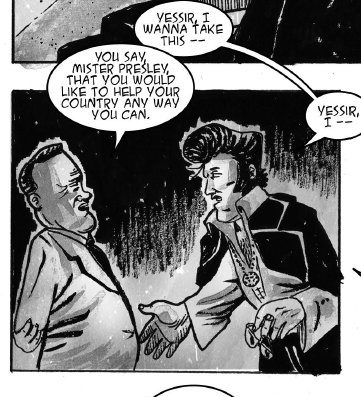 I also just finished lettering a full-length FUBAR tale featuring these two figures pictured above. This comes out in the music issue, on shelves pretty soon! Lots of great things going to press in 2015. Unboxing the Marvel Collector Corps Avengers blind box! Plus a quick Avengers: Age of Ultron review! A few months ago, Marvel announced that they'd be launching a new "blind box" subscription service. These have become fairly popular over the last year (maybe the most well known is Lootcrate) as collectors and fans apparently like to have random things shipped to them several times a year. I can relate to this; getting a package in the mail is always exciting and is one of the factors that defines my eBay obsession. Having Marvel jump on this bandwagon is no surprise as its existing fanbase seems the perfect type of consumer to sign up. Marvel calls the subscription service the "Marvel Collector Corps", which almost certainly tries to evoke memories of the Merry Marvel Marching Society of years past. Each kit costs $25 plus about eight dollars in shipping. Marvel claims that every box is packed with items that would retail for at least $50, and they ship six times a year. I decided to give it a try, thinking that I could keep what I wanted and sell the rest. The gamble here is that if I only wanted one or two things from a box, I could conceivably make most if not all of my money back by piecing out the rest; the danger is that I will want to keep everything in every box and lose money and space every other month. 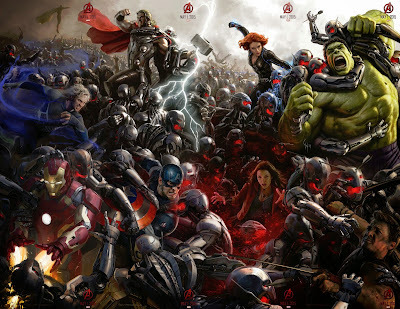 The theme for the first month was the Avengers, which of course made sense because of the Age of Ultron movie that came out at about the same time. My box came in the mail at the end of April, and it was really a sight to behold, with Captain America's head on the top and "Avengers" printed in bold letters on the side. The packaging design was a nice bonus on top of the items inside. Whoever at Marvel and Funko (Marvel's partner in the service) put the box together did a good jab at making even the packaging a collectable item. The inside of the top lid had comic book panels from various books (featuring Avengers members) printed on it. The first surprise upon opening the box, and something else that harkened back to the MMMS, was a patch and pin welcoming you to the Collector Corps. These two items just oozed nostalgia, and they're the little things that collectors will probably be searching for in years to come. The second lid folded back and revealed the main compartment with four different items. It was an impressive sight. The biggest and probably the most desirable item was probably the Hulkbuster Iron Man Funko Pop figure. This (and each item) was an exclusive to the service and it was without a doubt the centerpiece. It's a hefty piece, bigger than the average Funko figures from the same line. It's an impressive figure. Marvel also launched its "Dorbz" line with this kit. It's funny that included in this blind box is another blind box, but I guess that's a successful marketing ploy at the moment. Inside the box is a vinyl figure featuring yet another Age of Ultron character. Next up was an Avengers shirt. Apparently every box will include a shirt, and at least this time around, there were a total of four Avengers shirts, randomly inserted, each featuring a different avenger taking on Ultron on what looks like a boxing match promotional poster. I got Thor. Lastly was a variant to the first issue of the new Guardians Team-Up series, of course featuring the Avengers. I'm glad that Marvel didn't forget to include actual comics in this subscription service. All in all, I thought that the first box was a triumph for the company. It included so many cool items - presented in a fun, collectible way - that it was hard not to get excited about it. These boxes are big - bigger than shoe boxes by half, I'd say - and they'll start taking up a lot of room in people's garages before too long. I signed up for an entire year of the boxes, so I'll be interested to see what June brings and what theme Marvel decides on. Of course, my big hope is that one day soon there'll be a Fantastic Four-themed box. Marvel is downplaying the team right now as it tries to reacquire the movie rights, so I don't expect it to happen soon, but eventually...I have to believe that there'll be some FF items arriving at my mailbox. Now that is a box I'll keep in its entirety. I might buy two. Free Comic Book Day and all of the things surrounding that weekend kept me from seeing the Age of Ultron movie when it came out, but I finally got a chance to see it a few days ago. It was a solid movie worthy of the franchise that has such lofty expectations placed on it. It wasn't a perfect movie, and I don't think it was as good as the first one - it seemed uneven in places, and I think there was an over-reliance on really long action scenes as opposed to the quieter character moments that made the first movie so wonderful - but it's worth going to see. It definitely tries to set up the movies that will come after, and seeing how this sequel is bringing in an ungodly amount of money, it's hard to envision a summer without a Marvel tentpole film for many years to come. Here's hoping the quality remains high and the movies remain enjoyable.